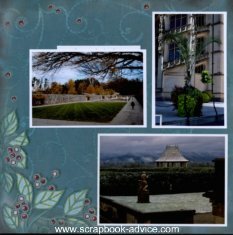 This page of the Biltmore Estate Scrapbook Layouts focuses on using papers from ClubScrap.com as they are always my favorite papers and embellishments. 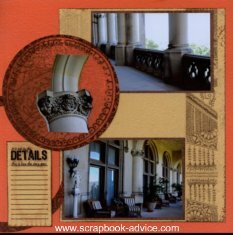 Hopefully, these layouts will give you some nice biltmore scrapbook layout ideas. Most of the layouts were from an process that Club Scrap calls ALSB or Assembly Line Scrapbooking. They design the layouts and when you purchase the kits, the layouts are also available to use. 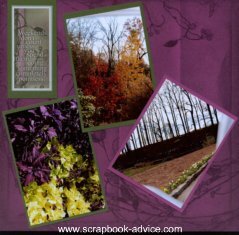 Scrapbook-Advice.com Tip: I like this ALSB process - when I just have a few minutes to scrap, I do some of their layouts and save them for later when I have photos that will look nice on that color paper. 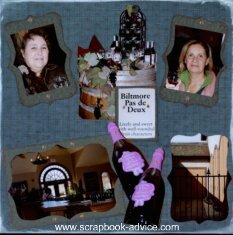 This Biltmore Estate Scrapbook page on the left uses background paper from Karen Foster called Grandma's Trunk. I used this in conjunction with the mattes and lettering font stickers and companion page from Club Scrap's Henna Collection from May 2009. 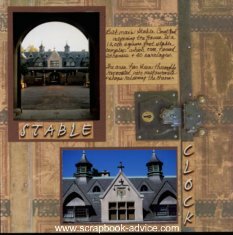 The lock on the trunk seemed appropriate for the Stable Area of the Biltmore House and the designs on the Henna papers reminded me of the elegance in the architecture of the home. The left page uses all papers, mattes, lettering stickers, journaling blocks and dark brown ribbon from the Henna Collection. 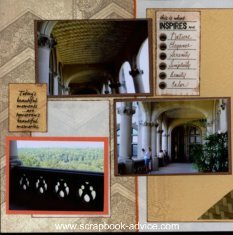 More photos on these Biltmore Estate Scrapbook Layouts from the Stable Cafe, again using the Henna Collection of papers, mattes, embellishments, lettering stickers, and journaling strips. The journaling strips were pre-printed for the layouts. The left one "Sometimes it's the smallest things that take up the most room in your heart," referring to the little tiny dessert sampler we ordered. The right one "Simple Moments...Great Memories." 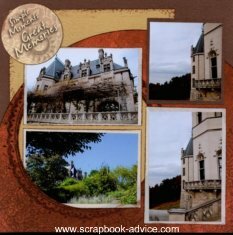 Scrapbook-Advice.com Tip: When I put together these ALSB layouts without photos, I use very little adhesive from my Tape Gun and I always put it on the short sides of the photo mattes or embellishments. Then when I put the photos on, if I need to turn a matte from horizontal to vertical, it can be easily removed and I always know where the adhesive is. Club Scrap has reissued the Henna Collection designs on a new Special Edition for 2011. 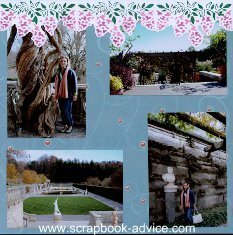 For these next Biltmore Estate Scrapbook Layouts, I have combined background paper on the left that came in the Biltmore Scrapbook Kit I purchased while at the Estate. The background paper on the left was from the Personal Shopper Scrapbook Kit from Febuary 2011. 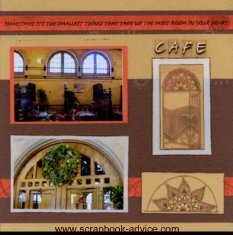 Scrpabook-advice Tip: I was trying to match the two papers in color and since the edge of the left paper was distressed or faded on the edges, I used a white ink pad to distress the edges of the left paper to give the same look. 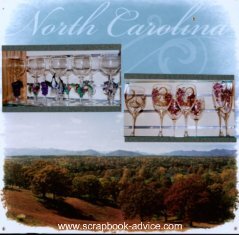 These layouts of the tour of the Winery on the estate, shows some of the wine and wine glasses we purchased and the tasting area of the winery. 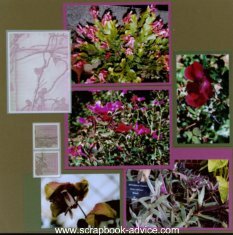 The photos and mattes on the right page were cut from a stencil that came with one of my Personal Shopper Kits - the Easy Scalloped Frame Template - with various bracketed sizes and shapes. Here's where you can get the Template. 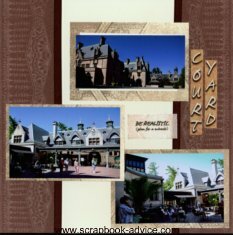 These next two layouts for the Biltmore Estate Scrapbook use papers from a Personal Shopper Scrapbook kit. I thought the mottled green background coordinated nicely with the floral photos. All photos were matted on Ivory cardstock from my stash and the edges were inked with Tim Holtz's Crushed Olive Distress Ink. The other embellishments were the three small butterflies from my stash and three acrylic black frames around three small photos - or pieces of photos. 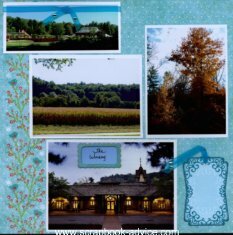 These next Biltmore Estate Scrapbook Layouts use a Special Edition Kit from Club Scrap called Naturally. This was a mini-kit in that there were just enough papers and supplies to do 6 layouts when normally their Senior Kits have enough to do at least 14 layouts. 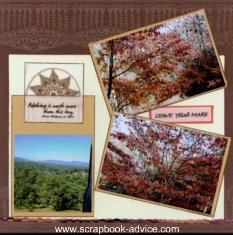 Scrapbook-Advice.com Tip: The layout on the left has one photo double matted and another double matted off center. At the bottom, the three photo mattes that were 3&1/2 inches square. The flowers in the photos were just a little too big to fit, so instead of cutting the blooms, I cut around them and the peek outside the matte just a little. Make it FIT! The right page layout was relatively easy since all the photos were flowers. The photo on the bottom, was cut with a notch out to accommodate the photo and matte above it. 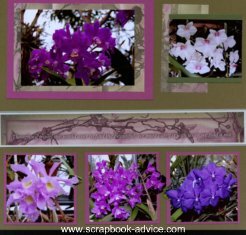 For more ideas on Creative Photo Cropping. More photos from grounds on the estate and more ALSB Layouts using items from the Club Scrap Naturally Kit. This was a great layout for some of my photos that were a little crooked. Scrapbook-Advice.com Tip: I was trying to take photos from inside the car and not hold up traffic, and they came out crooked. Since they are on the tilted mattes, the crooked part does not appear so bad. 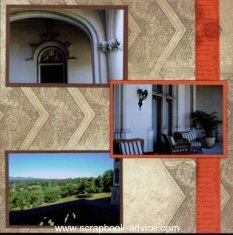 Switching back the Club Scrap Henna Kit Assembly Line Scrapbook Layouts (ALSB) for these next sets of layouts with photo taken from the Back Porch of the Biltmore Estate. The Journaling block on the left - "It's all in the Details, this is how the story goeS." The journaling will be some specific details about the views. The journaling blocks on the right - "Today's beautiful moments ...are tomorrows beautiful memories" and "This is what inspires me...". Each of the items on this listing is accented with an antique copper brad. 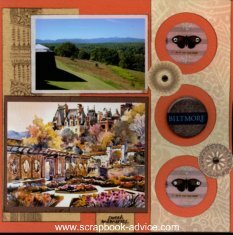 More Biltmore Estate Layouts using the Club Scrap Henna Kit, with their beautiful textured papers. All photo mattes and one embellishment have been inked with Tim Holtz's Vintage Photos Distress Ink. The right journaling block say simply "Leave Your Mark". Certainly an appropriate comment for the Biltmore Estate House and Grounds. 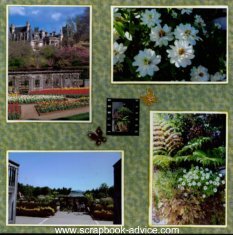 The last of the Club Scrap Henna collection layouts for the Biltmore Estate Scrapbook show views to and from the Walled Garden. These layouts focus on the circular images provided with the die cuts and embellishments. One round embellishment "Biltmore" was from the Biltmore Scrapbook Kit and the butterflies were from my stash. The circles were die cuts from the Henna kit attached with antique bronze brads also from the kit. 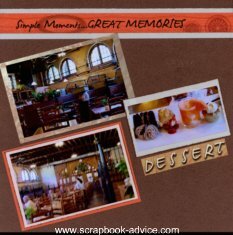 The left side journaling embellishments says "Simple Moments, Great Memories" the one on the right says "Sweet Memories." Here, two photos are tucked behind the background paper which has been cut with a craft knife to make just enough room to slide in the corner of the photo. 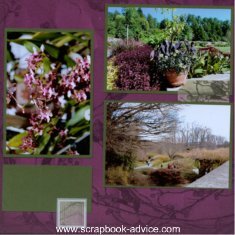 The large photo on the right page is a reproduction of an original watercolor painting from the walled garden by a local artist Ann Vasilik. There was only one photo matte on the ALSB layout, so I added an additional piece of paper to extend the matte to accommodate this photo that was 5 & 1/2" x 7". 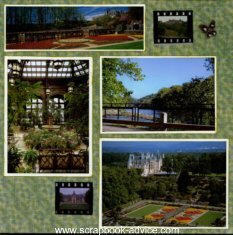 These layouts from the Biltmore Estate Scrapbook were from the walkway to the Walled Garden. The overhead lattice work is covered with Wisteria which bloom with purple flowers during the Spring. 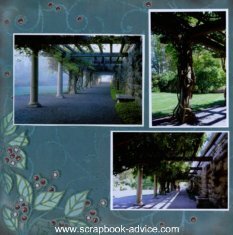 Since we were there in the Winter, I used my Spellbinders Wisteria Borderabilities which cuts a strip 12 inches long. I chalked the flowers and leaves with several colors of purples and greens from my Pebbles Metallic Cream Chalks set. 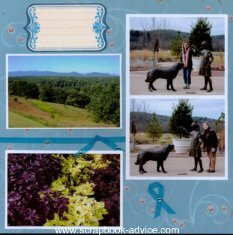 The final layouts from the Biltmore Estate Scrapbook contains photos where we posed with the statuary in Antler Hill Village. 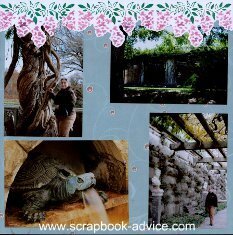 for More Scrapbook Layout Ideas.